The Nexus 7 is being talked about, that’s one thing we know for sure. It’s gotten a ton of press as a device that is so good it makes the case for small tablets in general. It’s certainly one of the most well received non-iPad tablets ever. I even argued that it was Google’s best chance to jump-start the Android app ecosystem. But these things are usually hard to quantify, and selling a lot of tablets doesn’t necessarily mean that the users of those tablets are going to suddenly start purchasing apps, something that Android isn’t exactly famous for. That’s why some interesting statistics from Mobelux’ Jeff Rock caught my eye. Mobelux, if you didn’t know, is the studio that (among other things) bringing the popular read later app Instapaper over to Android. 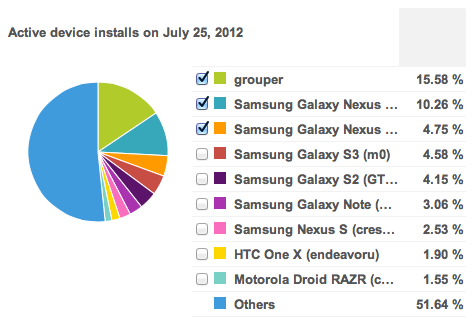 Rock shared some stats with us about the app surrounding the launch of the Nexus 7. First, the big stat: Instapaper for Android saw a 600% jump in downloads via the Google Play market that lined up with the day people started getting their Nexus 7 tablets. Rock says that some of this could likely be attributed to the $25 credit that Google issued with the tablet, but he doesn’t believe it accounts for all of it. We asked Rock what device dominated the lineup before and he said that it was definitely Samsung devices all the way, including the Galaxy Nexus line. In tablets, the Galaxy Note was the device that took the second largest number of installs, with the 10″ tab following that. The Nexus 7 easily bests those numbers, even with its very short time on the market. “We’ve always felt that Android tablets were where the Instapaper for Android market was at so we’re thrilled to see an Android tablet that’s finally resonating with people,” he says. “I’m also pretty impressed with how up-to-date and energetic the user base is. 70% of devices are running 4.0+, which helps to disprove the notion that all Android development has to be a legacy support nightmare,” Rock said, referring to the general consensus that Android development is hindered by software fragmentation. One app does not an ecosystem resurgence make, but, as I said in my review of the device, the importance of the Nexus 7 lies not with its features, but with its ability to deliver Google’s tablet ecosystem the series of pulmonary shocks it needs to finally get into the proper rhythm. Maybe this is the first sign of it doing just that. Either way, if you’re an Android developer, then it looks like the Nexus 7 is the device to target.